LONDON: Second-tier Championship clubs Birmingham City and Aston Villa accepted fines of £5,000 for failing to control their players in a fiercely-contested derby match earlier this month, the English Football Association (FA) said on Monday. 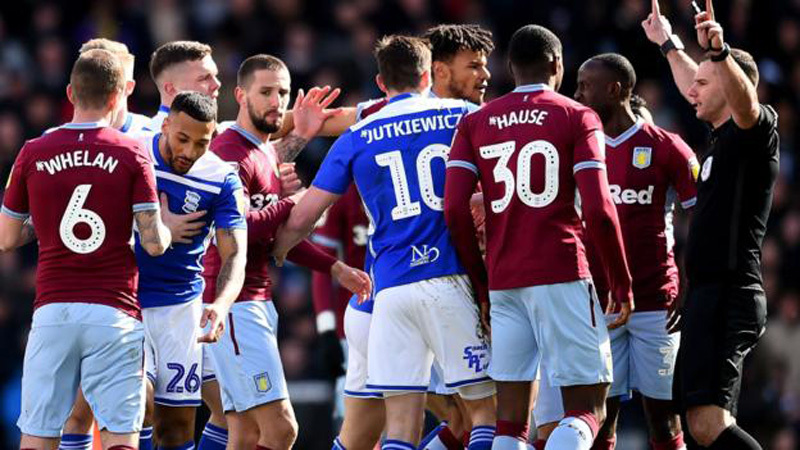 Players from both teams were charged with breaching FA Rule 20 after a confrontation followed a foul by Birmingham’s Maikel Kieftenbeld on Villa captain Jack Grealish in the fifth minute. “Birmingham City and Aston Villa have been fined 5,000 pounds following their EFL Championship fixture on 10 March 2019,” the FA said in a statement. “Both clubs accepted a charge and the standard penalty for failing to ensure that their players conducted themselves in an orderly fashion during the fifth minute.” A Birmingham supporter was jailed for 14 weeks for running on to the field of play and punching Grealish later on in the match. Grealish, who escaped unhurt, eventually scored the winner as Villa won 1-0 to leapfrog their derby rivals in the standings.